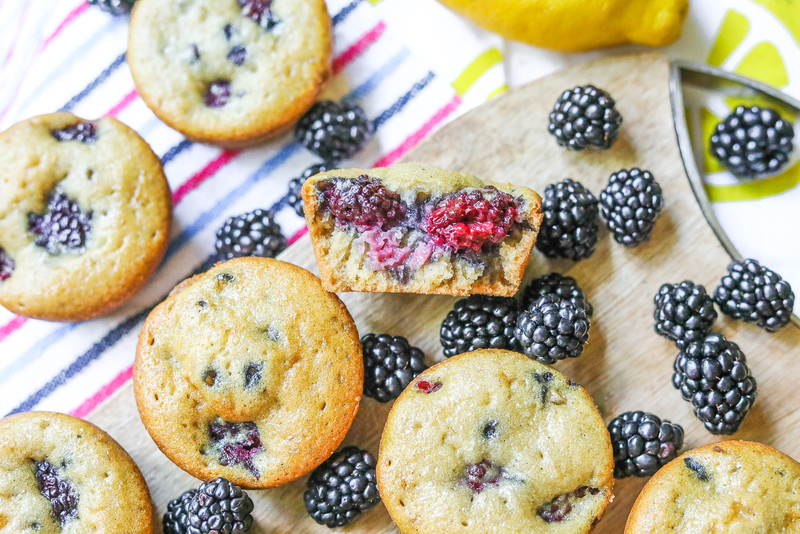 Now that the dogs have been on their walks, and I have freshly brewed coffee in my cup, I can share my lemon blackberry protein muffin recipe with you! It was beautiful out this morning, but it’s the South, so the breeze will quickly turn into humidity in about an hour. When it’s too hot to spend time outside, I usually get a lot of things done around the house. 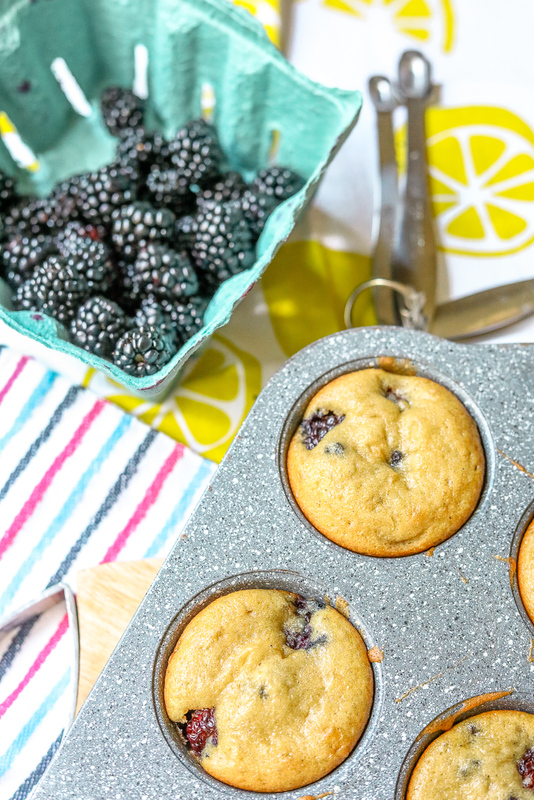 On Monday, I spent several hours power cleaning and then decided to bake delicious muffins to use up the blackberries I picked at the Farmer’s Market last week. I love baking after cleaning because it tops off the job with an amazing aroma in the house. Who needs a sweet candle when you can bake the real deal? I’ve been enjoying farm fresh strawberries, raspberries, and blackberries this past month. 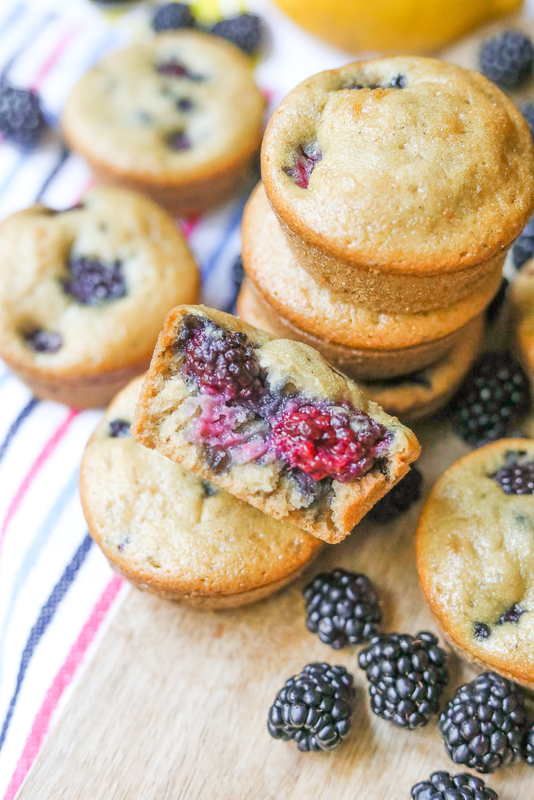 And since I’m on a muffin kick, it made sense to incorporate the fresh blackberries into one of my batches. I also froze a bunch for smoothies, too! Blackberries are rich in manganese, vitamin k, vitamin c, fiber, and up there with the blueberries when it comes to antioxidants. 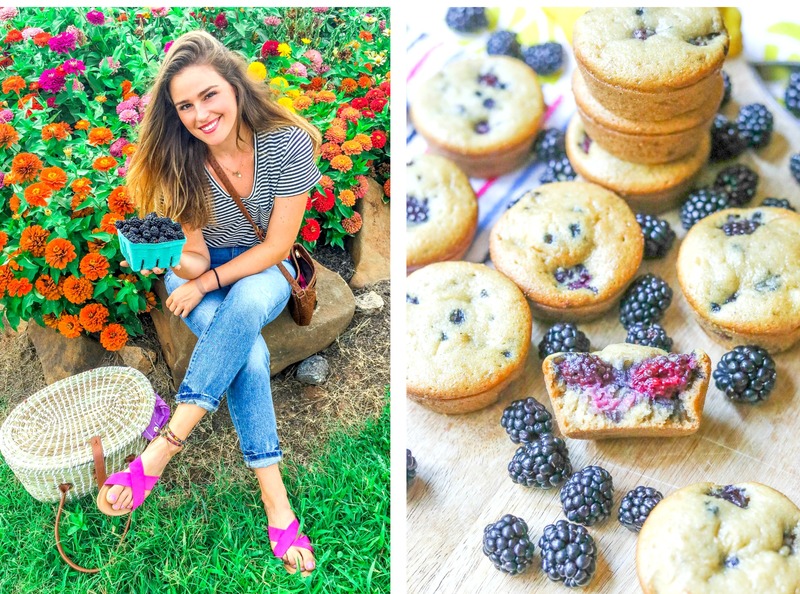 If you’re ever feeling sluggish, a handful of blackberries can help! I also love a muffin that has protein. When I wake up, I always grab a small snack before going out to walk. I’m one of those people that wakes up so hungry! Keeping muffins filled with protein, or homemade protein bars (recipe coming soon) in the house helps me make quick nutritious decisions before running out the door. My boyfriend also appreciates a good protein snack after the gym in the evenings. He says keeping healthier baked goods around prevents him from diving into the ice cream, chips, or peanut butter jar. Oh, and that kid can eat peanut butter! I usually use bananas and oats in my recipes, but I decided to switch it up! 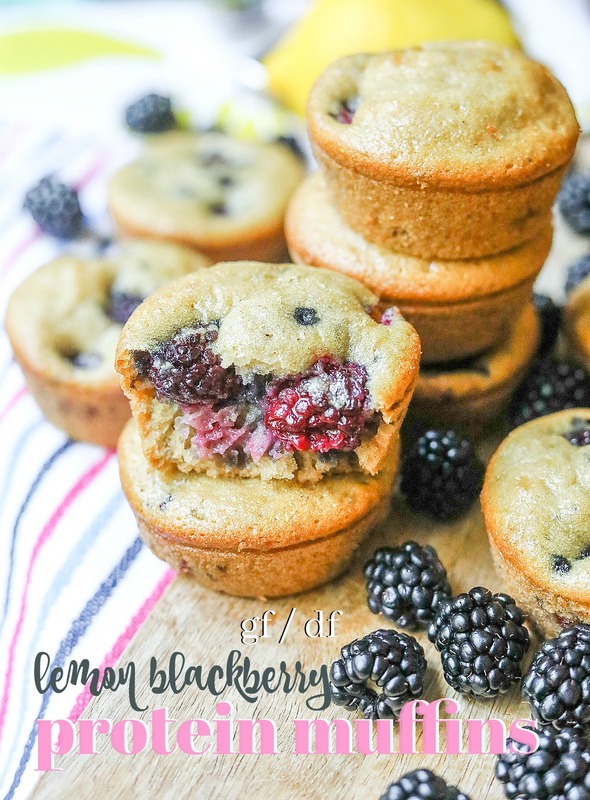 I thought these lemon blackberry muffins deserved a fluffy cake texture instead of being brought down by the oats. Don’t get me wrong, I love a good oat muffin! Actually, I probably like them too much. I got lucky when I found a lemon in the fridge. I am usually out of lemons, or they go bad before I remember buying them. Blackberry lemon sounded like the perfect combo! It’s a fresh and airy match to make these perfect for the summer months! Whenever a recipe turns out perfect, I get so excited, especially when it’s an unplanned bake. As soon as the toothpick came out clean, I knew we had a winner. I wish you could have smelled the house while these were baking! It was the first thing Kyle commented on when he got home from work. “mmmm what’s that smell? !” Of course, my excitement kicked in when I ignored his hug, went straight for his hand, and guided him into the kitchen to make him try one. Kyle is the ultimate taste-tester. He’ll never tell me when he doesn’t like something, but he has signature keywords and actions to help me decide what he’s really thinking. I’m pretty good at reading him, and I got the three signs that these were a success. The first sign was when he let out a “Wow, these are so good!” His eyes usually grow big when he really likes something, which was the second sign. And lastly? He didn’t put the rest of the muffin on the plate to “finish later.” He demolished this muffin in two bites! 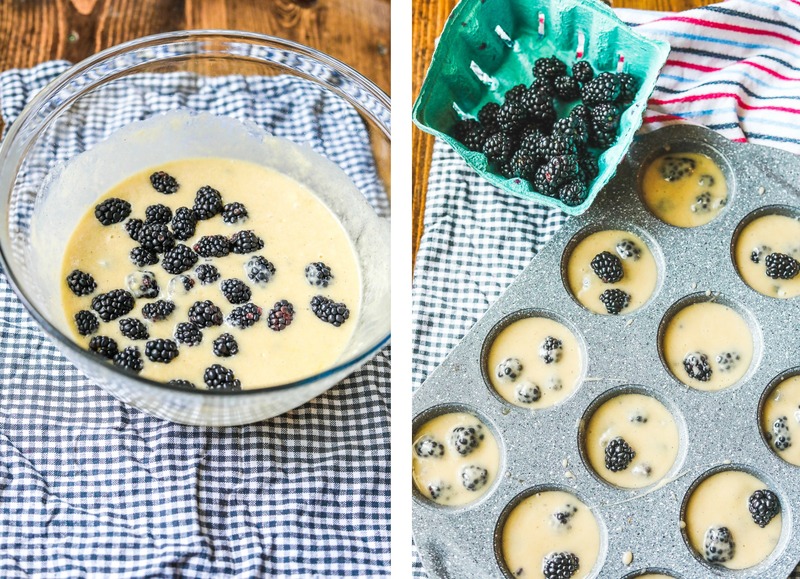 Grease a muffin pan, and set aside. In a large mixing bowl, sift together the almond flour, protein powder, coconut flour, sea salt, cinnamon, baking soda, and baking powder together. In a separate bowl, beat the eggs and mix in the lemon juice, sunflower oil, almond extract, vanilla extract, and cashew milk. Pour the wet ingredients into the bowl with the sifted flour mixture. Combine well, and mix in the honey. **All protein powders are different, so if the batter seems a bit "thick", just add in more cashew milk by the tablespoon until you get a "cake-batter" consistency. **And if your batter is too "watery", add in more coconut flour by the tablespoon. Add about 1/2 cup of the muffin batter into the muffin pan. Bake for twenty minutes, and use the toothpick method to determine when they're finished. I’m excited to visit the farm again soon to pick up some more inspiration for my next recipe! After hitting the publish button, I’m going to get started on writing the recipe post for my homemade protein bars, so stay tuned! Have you ever done a Farm Share? Do you try to cook with seasonal produce? I’m looking to bake a pie! Do you have a favorite recipe that I should try out? Great recipe! I subbed powdered ginger instead of cinnamon, avocado oil for less of a coconut flavor and almond milk. Orgain is my fav protein powder and ill def make these again! Hey Taralynn! I’m so excited to make these but I’m wondering if it can just be 1 1/4 cup of all purpose flour instead of having to go buy the two different kinds of flour? 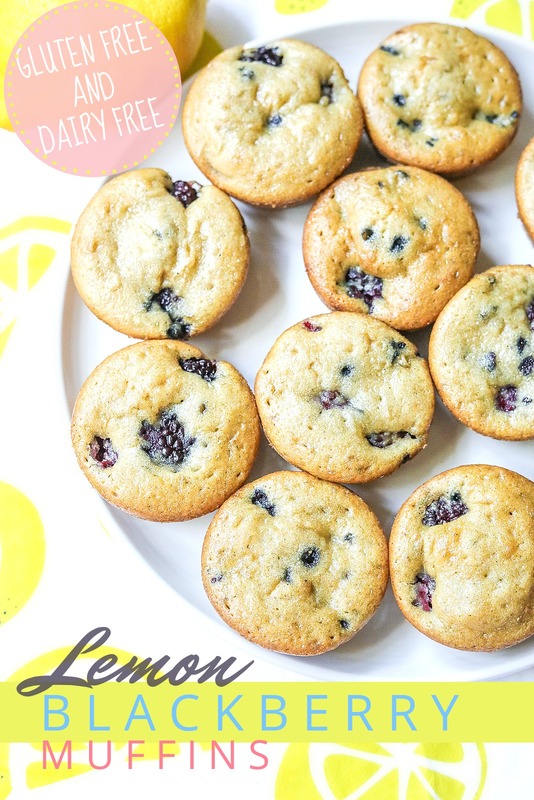 I tried the lemon chia muffins and they were delicious so I have super high hopes for these! Hi! These look great! I was wondering if I could substitute the protein powder with just flour? I’ve tried a few different protein powders but I’m just not a fan of the taste. I don’t know about the swap! It really depends on which flour you use! Have you ever used Orgain protein? It’s a gamechanger, plant-based, and tastes amazing when baked! I’ve never tried Orgain… I guess I could try it I just have such a sensitive taste for protein powders. I can always taste it and I feel like it throws the texture off. I guess I could give it a try. I find that the dairy proteins are like that, and some plant are chalky, but Orgain is the one protein I stand behind the most! These look sooooo good! Do you know how many calories are in them? Would this work with strawberries? Yes! Lemon & Strawberry muffins would be great! I have never done a farm share but living here in the garden state I have thought about it many times. Can’t wait to see if you go through with it and what your experience is. Have you ever done a Farm Share? I don’t cook with seasonal produce NEARLY as much as I should. I’m trying to be better at it. Yum! Pie sounds delicious. I usually stick with the go to apple pie. I feel like you can’t go wrong! Unfortunately I don’t have a recipe to share! I hope you get to visit this weekend! I’m sad because my weekend is going to be filled with rain 🙁 boooooo! I’m excited to try it out. I think I’m leaning towards yes! I’ve heard great things. Definitely do a farm share! We just got our share this afternoon and plan to make salsa and some baked goods! Sounds like I need to do this!! Haha I was laughing at Kyle’s giveaway clues because Ben is the same way. He’s too nice to say he doesn’t actually like something, but after 10 years I’ve figured out what “hmmmm, what’s the ____ taste coming from?” means (not good!). And when he really loves something, he high fives me and says we need to put it on our future restaurant menu (fyi there are no actual restaurant plans haha). I am in love with these flavors and can’t wait to make these! Especially because we’re about to travel and we need some good plan snacks/meals. Farm shares are AMAZING. I love supporting local businesses and I truly believe that food tastes better when it’s local! 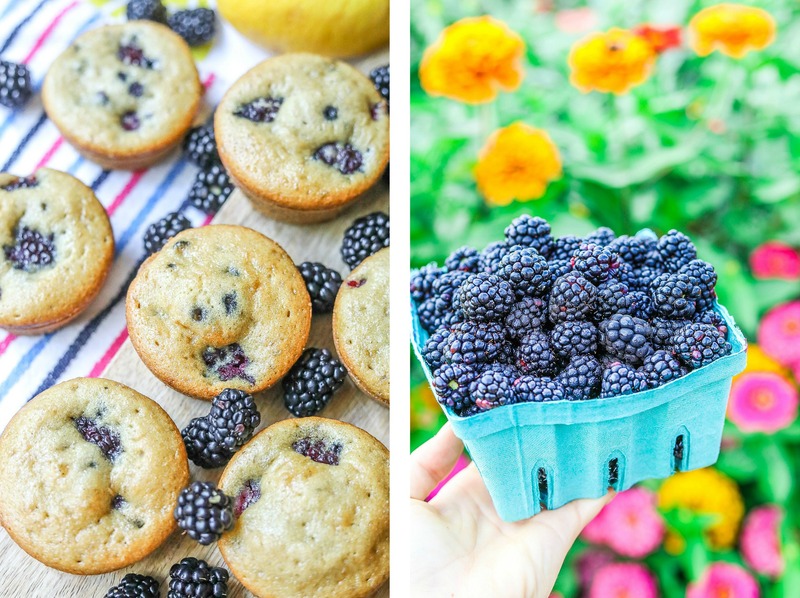 We’re all about seasonal produce, which means our summers are FULL of berries, plums, melons, peaches, etc. In CO, all of those things disappear for the winter and it’s so sad. PIE! Give me ALL the pie. Cherry is a classic favorite for me but Ben says he votes peach! Hahaha that is funny. I guess it’s a “nice” way to put their honest truth. WELL…CHERRY PEACH?!?!? Could be a good combo! I love the peanut butter banana muffins. So yummy! Could you use just almond flour? I don’t have coconut flour on hand. These look amazing!! Can’t wait to try the recipe! I’m also wondering – how many grams of protein do you usually have a day? I always shoot for 100 grams! Bake an apple pie because I know that fall will come soon! Yay! I cannot wait to bake these this weekend! I am going on my wedding/honeymoon trip next week and we are going to bring snacks and sandwich stuff along so we aren’t eating out EVERY meal. These will be perfect! Thanks! What could i use instead of lemon? We joined a CSA for the first time this year. (Friends of ours have a farm just outside of town). It was the best decisions ever! I live in Lexington VA so not super far from you, and although prices will vary, we pay $25 a week for all of our farm goodies! My family of 6 has a hard time getting through all of the food each week, it’s so much! It’s been so much fun eating with the season and trying new things. Even my kiddos get excited experimenting with new things. The other benefit to being a part of a CSA is you know it’s traveling a short distance from the farm to you and for me personally, my friend doesn’t spray or use chemicals which is really important to me. I would not hesitate if I were you! Your photos are on point! These look amazing and I can just imagine how nice it left your place smelling! I have never done a farm share but I sure do love hitting up the Farmer’s Market! I went yesterday actually and I’m already excited to go again this weekend! I typically try to eat seasonally — it’s usually cheaper (especially if it’s something I can grow in my own garden!) But I feel like it’s also healthier! If you get it from somewhere local, you can be sure the food is fresher, grown without added hormones, and just tastes better. I love a good pecan pie but it’s not really the “season” for that. Otherwise, I’m always up for a slice of peach or cherry pie! Looking forward to that recipe too! Have fun at the market this weekend! I may sneak a trip if it doesn’t rain! You’re so right!! Seasonal eating is healthier and cheaper! I’ve never attempted a pecan pie, and I need to add it to my list 🙂 MMM cherry would be good!! Yum!! 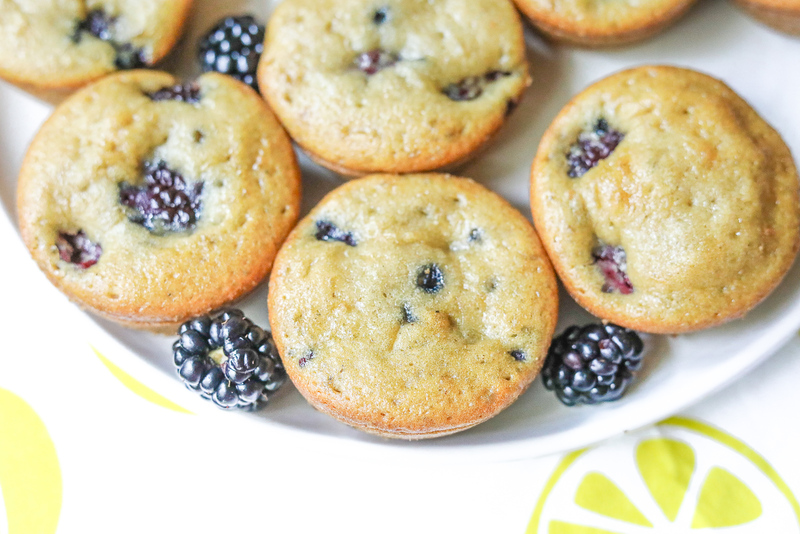 Lemon and blackberry sounds like a delicious combo. I’m very angry I made these. Why? I ate four of them! The kiddos loved them too. We swapped honey for agave and used gluten-free flour instead of coconut flour and almond flour. We used 1 cup as the swap for anyone wondering. Thanks for the great recipe! I look forward to trying many more. This comment made me smile! 🙂 Thanks for sharing your swaps, and I’m so so so so happy your kiddos enjoyed these! A great way to get them to eat some fruit and extra protein! I loved reading this post. I have been dreaming of fall, but your writing brought me back to appreciating the summer. These look awesome! I recently made your peanut butter/banana muffins, but i’m out now so these will be next on my list! I have some blueberries I need to use up, so I’ll probably swap those for the blackberries. I’ve never done or heard of a farm share, but it sounds like a great idea. Hope you have a good weekend! 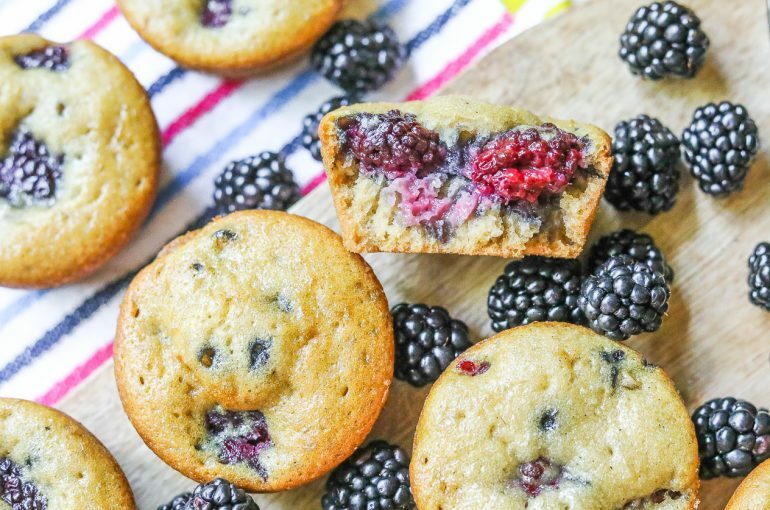 Those peanut butter banana muffins are a staple around here, but it was fun to switch it up with these! I’m new to learning about the farm share, but might try it out! It’s so cool you run a farm! I will 100% email you! Thanks! !